Judge Hujmetewa, 51, served as U.S. Attorney for the District of Arizona following an appointment by President George W. Bush in 2007, and received unanimous Senate approval for the Federal Judgeship following her nomination by President Obama in 2014. She was promoted for the position by Republican Senators John McCain and Jeff Flake. 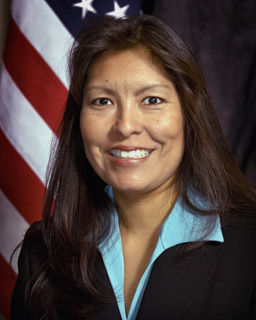 She is the first Native American woman and enrolled tribal member to serve as a federal judge in the United States. She is one of only three Native Americans in history to serve as a federal judge. Judge Hujmetewa is a member of the Hopi tribe. A graduate of the Indian Legal Program at the Arizona State University College of Law, Judge Humetewa served as a judge pro tem on the Hopi Tribal Appellate Court and as an ad hoc member of the Native American Subcommittee of the U.S. Sentencing Commission. She also has served as a Professor of Practice at ASU’s College of Law. She is considered an expert on Native American legal issues. Judge Humetewa’s name has been suggested as among the most likely persons to successfully move through Senate confirmation during President Obama’s final year in office. Because of her background, and because she won total support for the federal bench only two years ago it would be difficult for an obstructionist Senate to block such an appointment at this time. What would be grand about such an appointment: it would give Native American tribes a voice on the highest judicial bench in the land. This would be significant since the United States has numerous laws that specifically involve the Native American tribes. The court rules on an average of one case a year dealling with federal Indian law.